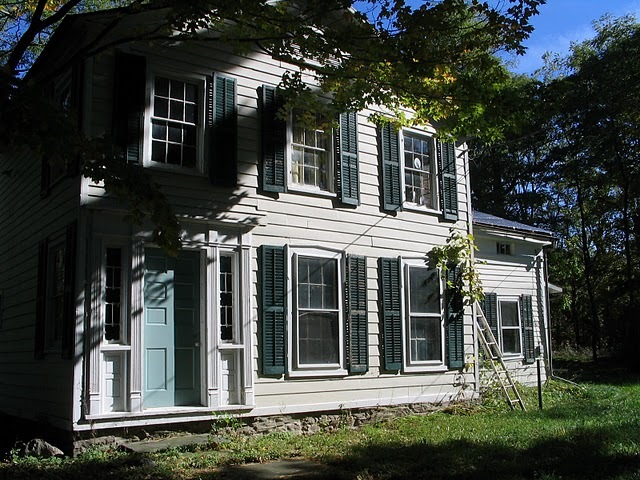 Last summer we did a lot of work on the Golding Farm House to make it habitable for folks. Fortunately for us at that time the folks were friends and not paying customers. They didn’t mind the fact that we’d covered up the cracks in the walls with “tapestries” and that there was one room that still had giant holes in the ceiling among other issues. There’s something really special about this house, but it’s hard to put your finger on what exactly. We really love it. None of us has ever actually lived there, but there’s just a really warm and special feel to this house. There must have been a lot of love in this house over the last 150 years that we can sense somehow. Sadly I remember when this house was not treated with a lot of love–we used to rent it out to a series of families that didn’t treat the house or the grounds with much respect. I remember more than one occasion when we hauled out loads of junk, cleaned off caked-on grime from many surfaces and washed windows that hadn’t been washed in decades. Over the last 3-4 years we’ve worked slowly at it and the improvements have been incremental. Many of us have done this work: my Mum and Dad, my brother of course who lived there last summer, my aunt and uncle and even my uncle Floyd before he passed away. Maybe that’s why we love this house, because so many of us have invested in it. *Please note that not all Covert family members agree on this plan of attack for the re-configuring of the top floor. I am a fan of this plan because it preserves the size of the stunning master bedroom which is huge and lovely, in my humble opinion. Stay tuned to see if I get overruled. It’s a kind of a strange thing, having a cottage rental property. It’s something that my family was thrust into and we’ve had an interesting time of adapting to this new aspect of our lives and watching it grow into a small family business. In February of 2006 my uncle, Floyd Covert, passed away after a lengthy battle with cancer. He owned several pieces of property in the Lodi area that he had inherited from various relatives over the years and these properties came to my immediate family, as we were his closest relatives. Floyd had had no children of his own, so he left his cottage to my brother and I. Floyd had inherited this cottage from his mother (my grandmother) when she passed away in 1994. So much to my surprise, and possibly my brother’s even greater surprise, we were now property owners. Neither of us owned property before this (we still don’t) and so this was a pretty big adjustment in our lives. I mean, it’s incredibly cool–I co-own a cottage! How awesome is that?! But on the other hand, it’s a little nerve-wracking, with the myriad things that need fixing in a 60-year-old property, paying property taxes for the first time and the inherent sense of responsibility that comes with such a thing. Let me just point out here that many people my brother’s and my age do, in fact, own property and so it’s not such a shocking proposition, it’s just that we had avoided this life milestone, that many others pass at our age or before, quite successfully until it was thrust upon us in this way. So here we were, faced, all of a sudden, with the very real property tax bills, repair and maintenance bills that came along with this incredible gift. Without the means to afford these new expenses we decided that the only way to be able to keep the cottage would be to turn it into a vacation rental property. Did we know what we were getting into? Not remotely. But we learned and adapted as we went along and ultimately have been able to make better improvements to the cottage than we ever could have without the income the rental brings. The first summer we were barely up and running in July, what with neccessary improvements to the water and well system and some cosmetic changes to the look and usability of the cottage. We redecorated, outfitted the place with sensible and useful items and got rid of an overabundance of chotchkes and pickle dishes in order to make the place ready for guests. We hosted several couples and families that first year, enough to get our feet wet and make some notes on how to proceed for following years. This is a serious undertaking, renting out the property on a weekly basis, but luckily my parents, who are retired and living at an adjacent cottage 6 months of the year, are able to manage the day-to-day operation of the business. My brother and I are peripherally involved, though we are all contribute to the management of the business in the larger sense. It sounds strange, but we love the cottage so much that we actually kind of enjoy sharing it with others, even though they’re relative strangers and staying in this precious family cottage that was built by my grandparents long ago. We are so lucky to have this incredible treasure in our family and the more people that can enjoy it the better.